There were 104 press releases posted in the last 24 hours and 153,263 in the last 365 days. Tactical power generation systems for Army units and deployed weapon, surveillance, Mission Command, and combat support systems are currently being provided by diesel generators that are often sized for peak load instead of average load. This inefficient use of constantly running generators reduces the reliability of weapon systems and creates undue logistics burdens when sustaining Multi-Domain Operations (MDO). The 2019 Global Force Symposium & Exposition occurring March 26–28 at the Von Braun Center in Huntsville, Alabama, focuses on exploring the capabilities outlined in the Army Operating Concept and how the force transforms from being adaptive to driving innovation for Force 2025 and beyond. The symposium not only looks at the present, but also points an “eye towards the future” in developing and maintaining “Readiness for Multi-Domain Operations”. “Operational Energy is a cross-cutting competency that impacts nearly every Cross Functional Team but is most relevant to the modernization priority of Soldier Lethality,” said Ronaldo Lachica, Director of Program Management for Solar Stik®, Inc. Solar Stik is exhibiting at this year’s event for the sixth year in a row and will showcase products that assist in providing precision logistics to Army forces in order to conduct MDO in a highly contested environment. For almost two decades, Solar Stik has manufactured tailored expeditionary power systems to provide soldiers with operational energy that extends endurance and operational reach, improves operational readiness, and increases reliability. These capabilities provide users with the ability to execute responsive sustainment to widely dispersed units in support of MDO. Solar Stik Team Members Ronaldo Lachica, John Gumpf, and Matt Parham will attend the three-day Global Force event in booth #100A. All three Team Members are experts on current and future expeditionary power developments. Ronaldo Lachica, CW4 USA Retired, has over 25 years of experience providing tactical, electric power, and logistics support to operational military units. John Gumpf, LTC USA Retired, also has over 25 years of experience with military power and served as a Branch Chief for Operational Energy for the Army Capabilities Integration Center (ARCIC). 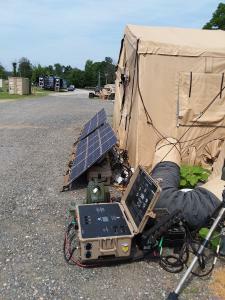 Matt Parham, Solar Stik’s System Specialist, worked as a Field Service Representative (FSR) for expeditionary power systems in Afghanistan and has personally designed dozens of hybrid power systems. All three Solar Stik Team Members will be available for the duration of the event to discuss Operational Energy solutions that offer significant fuel demand reduction and lessen delivery requirements by over 50%. They will be standing by to discuss how modular and scalable expeditionary power systems that integrate intelligent power management, energy storage, renewable power sources, and generator auto-start/stop provide autonomy and continuous operation for your units, weapon systems, and more. The Solar Stik Team Members will also demonstrate various hybrid power systems at AUSA, including a 2 kW system that combines photovoltaic charge control and AC output power in a single-case format. Check out the display of this and other products while learning more about Solar Stik’s Hybrid Power Systems at booth #100A. As Solar Stik says, “Your Mission is your Focus. Providing the Power for it is Ours”. Visit solarstik.com to learn more about its products, people, and company culture. Follow us on Twitter and Facebook using @solarstik. Contact Solar Stik at 800-793-4364 ext. 140 for more information.